More attention has been directed at the health of former college and professionals athletes. Data regarding the use of painkilling medications, the rates of chronic health conditions such as osteoarthritis, and the rates of disability have made many question whether the rush to return to play sports is worth the risk to your health. Former NFL players are the best example of these concerns. 88% of former NFL players claimed that they had excellent health at the beginning of their careers. That number dropped to 13% after their playing days were over. 93% admitted to dealing with pain on a daily basis, and 83% noted that pain to be moderate to severe pain. When you look at former college athletes, studies have shown that the long-term quality of life for former athletes is worse than people who exercised or played recreational sports. In fact, 40% of the former Division I athletes developed osteoarthritis later in life. What is the common theme with college and professional athletes? They often played through pain and injuries. The Washington Post surveyed over 500 former players. Almost 90% of them said that they played games while hurt, and 56% did so frequently. 70% of the former Division I athletes admitted to competing or practicing with an injury during their college careers. While it is understandable to want to return to play as quickly as possible, you need to keep your long-term health in mind. 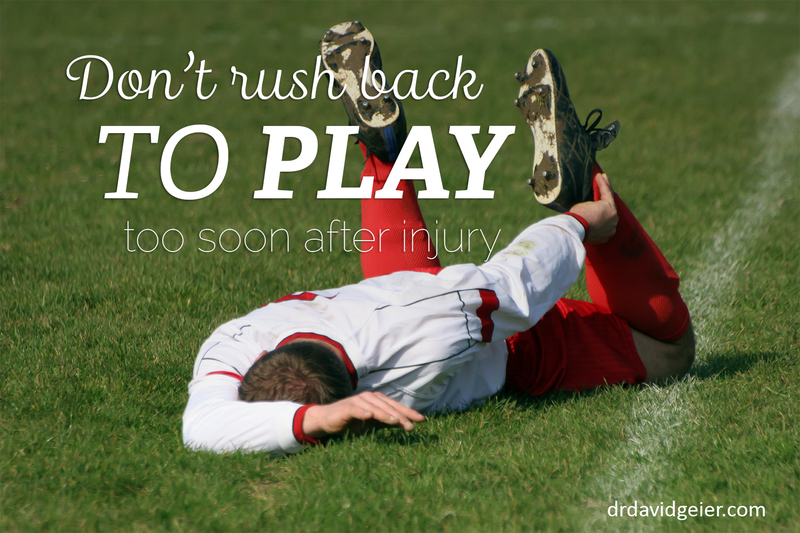 Whether you play high school, college or professional sports, and whether you play football, basketball or soccer, you must not try to return to play too soon. At a minimum, all athletes need to take all injuries seriously. Get appropriate treatment from the team doctors and athletic trainers, or consider getting a second opinion from an outside physician. Take whatever time is necessary to recover fully. Get all of your pain and swelling down. Complete a rehab program that replicates your duties on the field or court. Make sure all bones, tendons, and ligaments have fully healed before you return to demanding activities that will stress them again.